This technique is useful in biketrials, when you need to drop off sideways from an awkward position. Let's say, when the wheels are not on the same level, on uneven rocks. It you are just out of balance, you can nearly always do an emergency jump sideways with this technique. 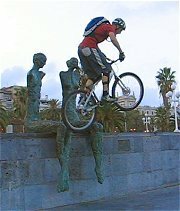 First you must know how to hop with the bike. Get as close as you can to the edge on the side you want to drop off. Prepare for an impulse to hop both wheels at once. 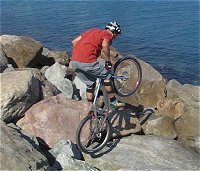 Regroup slightly on the bike when you are about to jump, slightly off-centered outwards. 1° Jump up with a small push up, followed by pulling the bike with you sideways. 2° Keep pulling up on the bike until you have cleared off the tires from the take off zone. 3° Once both wheels cleared, let the rear wheel go down first by extending the arms. Just before landing, realign the bike with you. It is important to target your landing zone with precision, and land aligned with the bike, else, you can fall sideways upon impact. 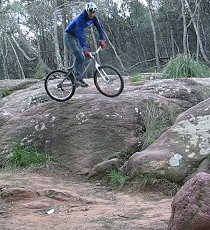 Turning the bike slightly with you in the air will stabilise the landing, as you'll land aligned with the direction of the move (usually turning perpendicular to the edge). When there is no room. 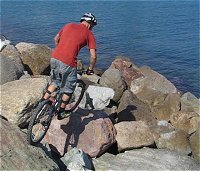 This approach is the cleanest when leaving a rough zone (with dirt and roots or slippery rocks) where it would be too risky to balance first on the front wheel (to do a pivot and drop the rear wheel first) or to balance on the rear. You must really clear the wheels from the edge you leave, else, if a tyre get stuck, you'll fall sideways. There is no pedal kick at all in this move. 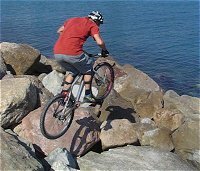 You can position the tyres near the edge with small hops, until you reckon you have reached the limit point beyond which the bike will lose grip (if you are on a rock or in a mix of dirt and roots). Then focus on landing your rear tyre on a specific target (for optimised grip when braking for example).